Written by Erin Murphy, Director of Community Engagement, YWCA Seattle I King I Snohomish. The sticker on my advocacy folder for the day. It was a diverse group at Advocacy Day. From service providers to faith community members to individuals impacted by homelessness, we all shared the identity of “advocate.” Our YWCA Seattle I King I Snohomish had a good showing of both staff and board members. Way to go persimmon power! YWCA board members and other housing advocates meet with Washington state governor, Jay Inslee. We were very excited to partner with the Housing Alliance to offer two social media advocacy workshops. Social media makes advocacy more accessible than ever but it is a unique language and can take some getting used to. So we offered a Social Media 101 for Housing Advocates prior to Advocacy Day and hosted it using Google+ Hangout. By using video chat, we could reach advocates all across the state! A snapshot of our 101 workshop. The entire training is available online and still applicable! View it HERE. We also offered a Social Media 201 workshop during Advocacy Day with an emphasis on how to use your smart phone to advocate throughout the day. We had great helpers assisting participants with individual questions including hands on demonstrations on personal phones. Here I am presenting with my social media partner, Joaquin, from the Housing Alliance. It was a great way to represent Firesteel and our network of YWCAs! The Seattle University Project on Family Homelessness compiled this great prezi slideshow. You can view the whole thing HERE. Advocacy, in its simplest form, is speaking up for a cause. We did this both in person and online. The Housing Alliance did a fantastic job setting up legislative meetings for almost every single voting district in the state. Members of the 36th voting district meet with Senator Kohl-Welles legislative aide. We also made sure to speak up online and created quite a buzz on Twitter! 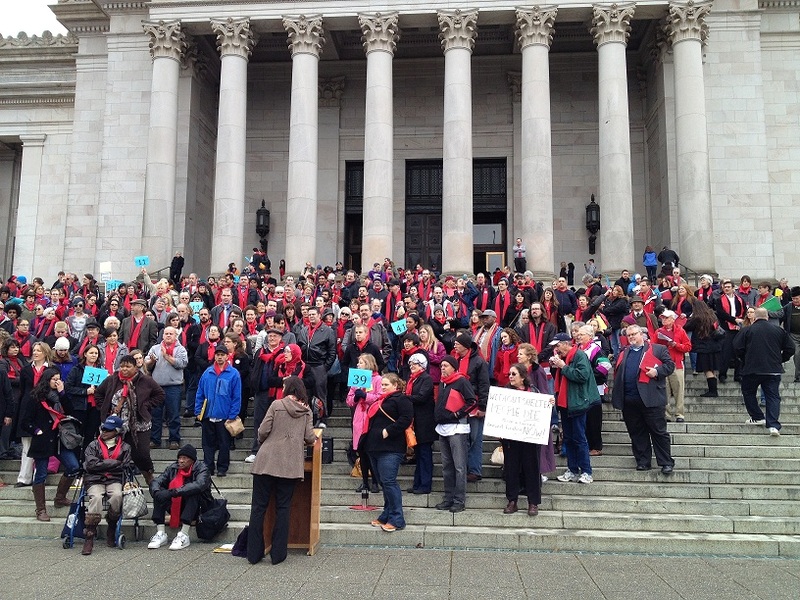 Read the entire online Twitter conversation by searching the hashtag #HHAD2013. We aren’t the only ones talking about this inspiring day, so check out what some of our community partners have to say about Advocacy Day on their own blogs below. By continuing to talk about the issue of homelessness, we can carry on the momentum of one day throughout an entire year.